Recent release “Still Here, for Thou Art with Me” from Page Publishing author Corinne Crowder is a highly defining account that tackles on trusting God amid the overwhelming human thoughts and emotions that affect one’s life. Corinne Crowder, a loving woman, and a passionate poet and writer, has completed her new book “Still Here, for Thou Art with Me”: a compelling compendium of poetic verses of the author’s pains and her will to overcome them with God’s benevolence and the promise of deliverance. Published by New York City-based Page Publishing, Corinne Crowder’s enthralling work shows an eventful and wisdom-filed life that the readers can relate to and ponder upon. 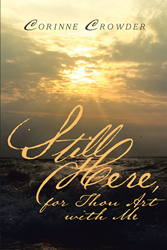 Readers who wish to experience this absorbing work can purchase “Still Here, for Thou Art with Me” at bookstores everywhere, or online at the Apple iTunes store, Amazon, Google Play, or Barnes and Noble.